JANUARY 24-29, 2019 WITH CO-HOST, NECTAR FLOW YOGA OF SPICEWOOD, TEXAS. Join us in the quaint seaside enclave of Cerritos Beach, just south of Todos Santos, for a 5 night, 6 day Yoga immersion. We’ll practice yoga up to three times daily in a gorgeous studio overlooking the Pacific Ocean. Daily practices will include a morning Power Yoga class, an evening Restorative or Yin Yoga class, as well as workshops and mini private sessions of 30 minutes each. For those seeking to take full advantage of our location, a walkable distance to one of Southern Baja’s best surf points, the surf package includes two surf lessons and one additional board rental. Your trip includes airport transfers* as well as breakfast, snacks and dinner daily. We’ll dine out at two of Todos Santos’ best farm-to-table restaurants, spend a day in town shopping, and check out a local Sunday market. Bonus: a night of guided stargazing from the pool deck of our yoga studio with a local astronomer! JANUARY 31-FEBRUARY 5, 2019 WITH CO-HOST, NECTAR FLOW YOGA OF SPICEWOOD, TEXAS. Join us in the quiet seaside enclave of Cerritos Beach, just south of Todos Santos, for a 5 night, 6 day Baja Adventure Retreat. 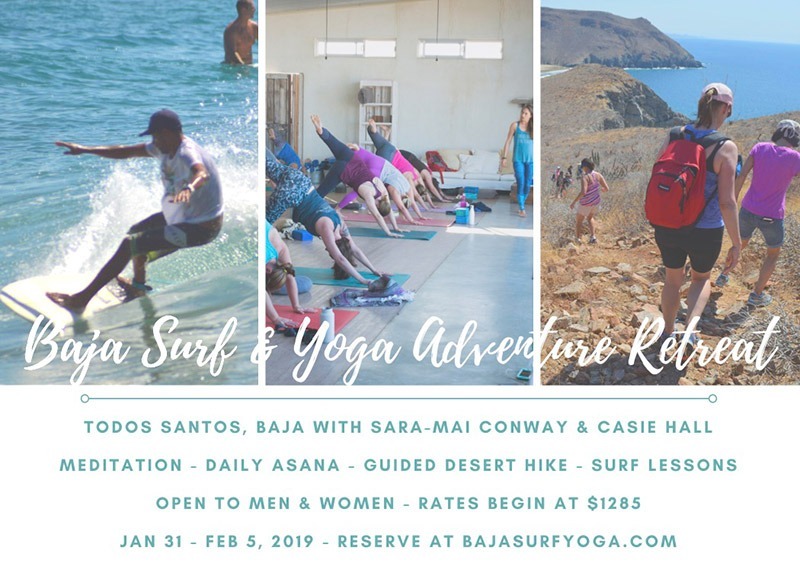 We’ll practice yoga up to two times daily in a gorgeous studio overlooking the Pacific Ocean, learn to surf at one of Southern Baja’s most consistent surf points, hike over desert cliffs to a secret beach, and stargaze far from the city lights with a local astronomer. Daily practices will include meditation, a morning Power Yoga class, and an evening Restorative or Yin Yoga class. This retreat also includes one surf lesson, one additional board rental, a naturalist-guided hike and a day trip to Todos Santos. Your stay includes airport transfers* from San Jose del Cabo as well as daily breakfast and snacks, and dinner on four of our five nights together.